Hatem Ben Arfa return from injury | NUFC Blog. Archive for tag: Hatem Ben Arfa return from injury. Ben Arfa on De Jong, Newcastle United and almost losing a leg. Ben Arfa: Could have lost his leg? 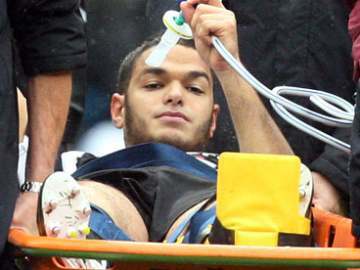 As the latter stages of his injury rehabilitation process continues, Newcastle United wonder winger, Hatem Ben Arfa, has been giving a series of interviews on the dreadful assault carried out upon his person by Manchester City hatchetman, Nigel DeJong, his long time out of the game because of it, to give his thanks to Newcastle United and it’s fans for the way he has been treated and more. “It is great to back in Newcastle and back with the lads. “I joined in with the warm-up this morning and managed to do a bit of light training on my own, and it was good to see the rest of the players after such a long time.